Camping World is off to adventure with a new Sweepstakes running online at CampingWorld.com/Adventure and in-store now through May 7, 2017. 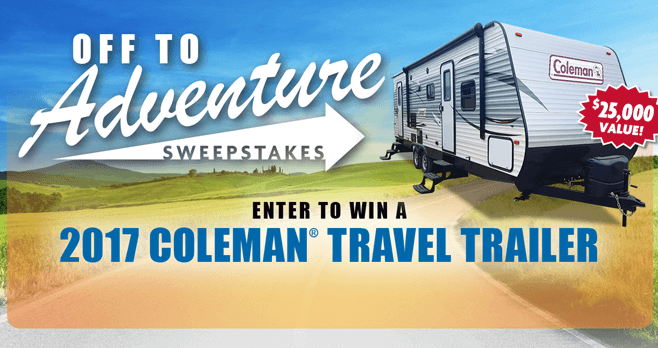 Enter the Camping World Off To Adventure Sweepstakes and you could win a 2017 Coleman 263BH valued at up to $26,260! Additionally, you may enter in-store from January 2, 2017 through May 7, 2017. Simply visit a participating Camping World location to complete an official entry form and drop your fully completed official entry form in the specially marked entry box in the participating store by close of business on the last day of the Sweepstakes. Eligibility: Camping World Off To Adventure Sweepstakes is open to all legal residents of the U.S. and Canada, who are 18 years of age or older, or of the age of majority in their state or province of residence, whichever is older, at the time of entry and have a valid driver’s license in their State or province of residence. Sweepstakes Period: Starts on December 9, 2016 at 12:01 AM CST and ends May 7, 2017 at 10:59 PM CDT. Limit: Limit one entry per e-mail address via the online method of entry. Only one entry per person via any method at any participating location. Grand Prize: A 2017 Coleman 263BH valued at up to $26,260. For more information on the Camping World Off To Adventure Sweepstakes, including official rules, visit www.campingworld.com/adventure now! Next articleRadio.com GRAMMYs Sweepstakes: Attend the 59th GRAMMYs!